Live music was performed from a stage on the east side of the park. Many of the bands were local to the Santa Barbara area including Ukulele Jim and The Rawhides. Not all the music was country and folk, however, and genres ranged from jazz to pop rock. On Saturday, attendees were treated to the annual Goleta Fall Classic car show sponsored by Prestigious Autobody & Paint linked up with the Goleta Lemon Festival to show off old classics from 9 a.m. to 3 p.m. Volunteers clad in yellow t-shirts mixed with vendors and patrons alike on Sep. 24 and 25 to offer an enjoyable experience for all age groups. There was food, drinks, games, merchandise and entertainment aimed at both children and adults. For the kids the festival provided bounce houses, mini-golf and a mini Ferris wheel with metal, cage-like compartments, all at a cost. There was also a rock wall and a inflatable pool in which children zipped inside plastic bubbles were able to roll around. With temperatures in the low nineties I was glad to be admitted into the Lemon Lounge, a shaded area of tables, chairs and couches where adults could relax, drink wine and beer, and play corn hole. Hollister Brewing Company sold a lemon ale made with local fruit. The beer was acutely crisp and astoundingly refreshing, a smooth balance between the citrus flavor and the wheat beer. The hot weather provoked me to buy a second. For those under 21, there were many tents selling lemonade. The Goleta Rotary Club offered a small drink for $3 and a large drink for $4 with $2 refills. Their lemonade was easily drinkable but in no way remarkable. A pie eating contest took up the noon time slot on both days — appropriately lemon meringue. 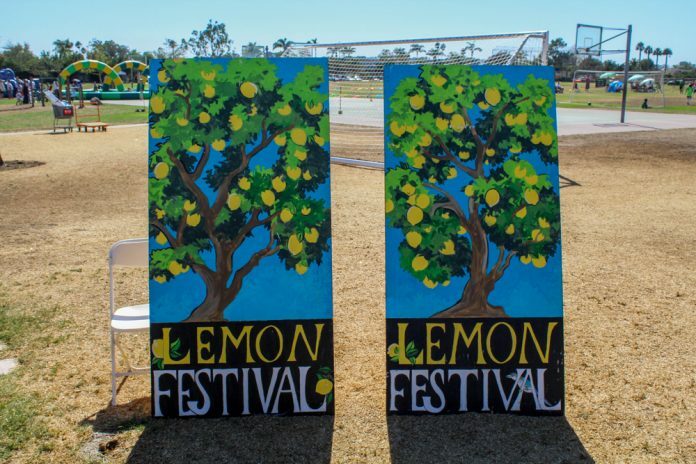 Among the other vendors peddling lemon products such as pies, bars and cotton candy were tents selling not citrus consumables such as gyros, kabobs, popcorn and Woodstock’s Pizza. 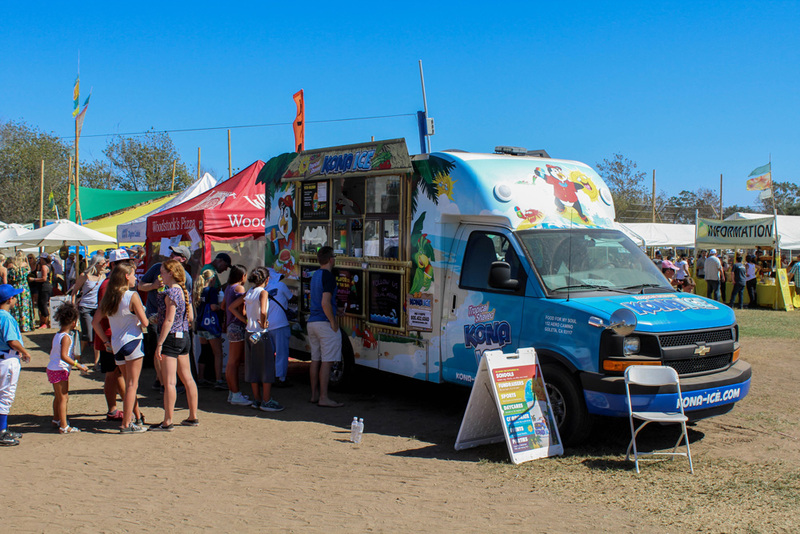 The Tropical Shaved Kona Ice truck also made an appearance. Samples handed out by a vendor convinced me to purchase a $4 pork tamale. Upon seeing my favorable reaction to the sample the vendor assured me that my response was not unusal and directed me to a tent with a handwritten sign and a set of trophies that he insisted were for awards for their Mesoamerican cuisine. The meat was excellently flavored and seasoned and perfectly tender. The corn meal was neither dry nor crumbly, it stayed together and did not overshadow the flavor of the pork. While $4 may seem steep when compared to the price of the handmade tamales sold door-to-door in Isla Vista, it was well worth it. Those sold at the Goleta Lemon Festival were in every way deserving of their trophies.